Multimedia stereo supports indoor/outdoor classroom activities and programs. Built-in microphone records student responses to help monitor their progress with lessons and reading practice. ABS plastic construction is durable to withstand the rigors of daily classroom use. Recessed speakers behind protective steel grills prevent accidental damage in busy environments. CD digital counter allows you to quickly locate lesson materials. Telescopic antenna features a reinforced jointing point for increased strength. Dual power supply operates the unit with either AC power or eight C-cell batteries for flexible performance. Stereo also includes AM/FM radio, carrying handle, 3.5mm headphone jack, 5' AC cord and more. Stereo is perfect for individual or group activities, literacy groups, ELD, ESL and other language learning programs. The built-in Music Port allows you to easily connect your compatible portable audio player (ipod etc.) and listen to music from your portable player through your micro system's sweet sound system. 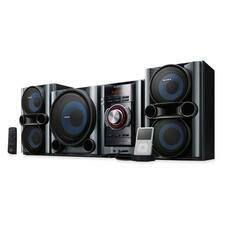 The built-in CD player features a number of functions so you can play music the way you want. You can listen to songs on a CD at random or program the SC-EN25 to play tracks in a specific order. Multimedia player delivers high-quality audio for differentiated individual or small group instruction as well as a class of up to 75 people. Built-in microphone records student responses to help you monitor their progress. Headphone/microphone and external speaker jacks allow individual learning or connect a jackbox for use as a group listening center. Recessed speakers behind protective steel grills prevent accidental damage in busy environments. CD digital counter allows you to quickly locate lesson materials. External casing is made with rugged, ABS plastic for safety and durability. 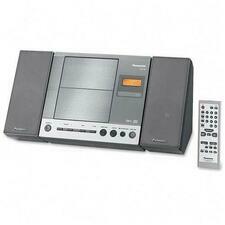 Dual cassette recorder/player also records from the CD player, radio and microphone units. Full-function remote control offers classroom flexibility and performance. Dual power supply operates the unit with either AC power or eight D-cell batteries for versatile performance. Multimedia player is perfect for teaching phonemic awareness, phonics, comprehension and other language learning programs. MP3/CD/cassette player with AM/FM radio provides a simple yet functional solution for playing high-quality audio. 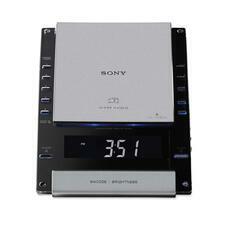 Top-loading CD player is compatible with both audio CDs and MP3 CDs. 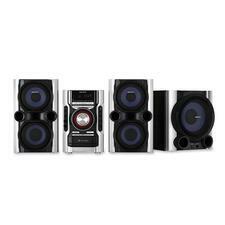 Full-range stereo speakers are housed in a rugged, ABS plastic case for reliable durability. Backlit LCD shows the track and time info for quick reference. 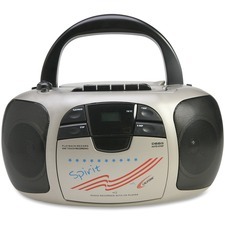 Cassette player features a built-in microphone for cassette recording. Infrared remote control offers complete control from virtually anywhere in the room. Expanded connections include a USB port for playing MP3/WMA files from USB drives and a 3.5mm jack for connecting to any device with line-out audio. Boombox also features a radio tuning dial, SD card port, 5' power cord and more. Boombox operates on AC/DC power or eight D-cell batteries (sold separately). MHC-EC98Pi Mini Hi-Fi Shelf System is designed for iPod music players. Offers easy compatibility via the included Digital Media Port (DMP) accessory, and simple plug-and-play integration with digital music players or PCs via a 3.5mm jack. Plug and play your iPod with the included TDM-ip10 iPod Dock. Mini Hi-Fi Shelf System plays factory-pressed CDs as well as consumer-recorded CD-R and CD-RW disks and MP3s. Provides accurate, drift-free tuning of AM and FM stations and allows you to preset 10 of your favorite AM and 20 FM stations. Features 265 watts per channel, 3.5mm headphone input, and 44.1 kHz/24-bit digital-to-analog converter. 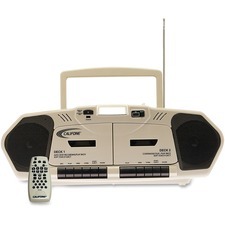 MHC-EC98Pi includes remote control with full iPod controls. 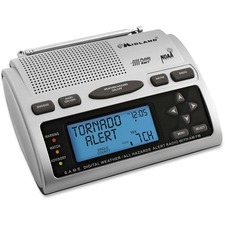 With the ability to adjust the siren volume level, this weather alert radio is the ultimate companion for receiving emergency alerts. Weather alert radio uses S.A.M.E. technology (Specific Area Message Encoding) that pre-programs the device to receive only those warnings that apply to your local area. You can choose state, county and/or nearby counties. The single-speaker radio offers 23 programmable county codes, AM/FM tuning, date, time, alarm functions and automatically switches from AM/FM to pertinent all-hazard alerts. For tuning, the radio employs drift-free PLL (phase-lock loop) technology and an easy-to-read blue, backlit LCD. You'll also get the convenient, 10-alert memory that lets you add, edit and remove unwanted alerts at any time. 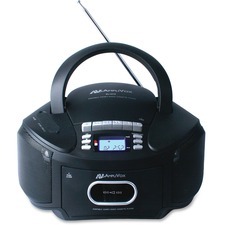 The radio uses the supplied AC power adapter or four AA batteries (sold separately). Experience big sound without the big system. The MHC-GX99 mini Hi-Fi component system has enough power to fill a room with quality sound. Play your favorite CDs and MP3 files burned to CD-R/RW discs and enjoy the dramatic bass from the 3-way bass reflex speaker system. And for precise EQ settings, just choose between four preset options and let the system do the rest.